Please refer to our stock # W-WD13 when inquiring. DESCRIPTION: A beautiful rendition of El Alma de Maria on tin, capturing the mystical descent of the Holy Ghost upon Mary and the announcements of the Incarnation. The young Mary is wearing a crown of pink roses, a pearl necklace and pearl earrings. With hands crossed over her heart, she presses the white dove toward her. This is a somewhat rarer depiction, because she holds not only a staff of lilies in one hand, but also a branch of roses in the other. Symbolizing her purity and exemption for worldly sins, the Virgin is dubbed a "rose without thorns" or a "lily among thorns." The artist created a balanced composition and skillfully painted and modeled the Virgin's features. The blue background and light radiating from her head provide a bit of depth to the scene. 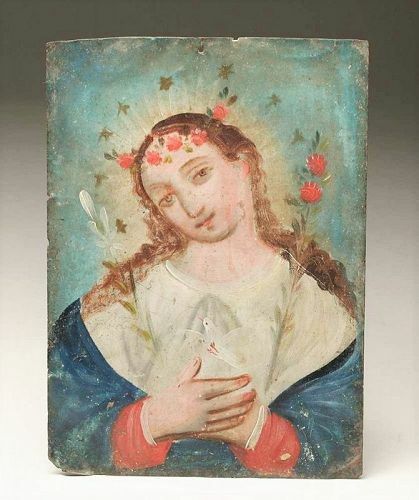 Mexico, 19th century, good condition. PROVENANCE: Ex-Ramon Kelly, a prominent Denver, CO artist. DIMENSIONS: 10" high x 7 1/8" wide.